Okay well it’s a big part of it, of being in Belgium for that matter, but Bruges is a gorgeous, romantic city and is perfect for a couple days to escape the hustle bustle of a major city like London, Paris, or even Amsterdam. 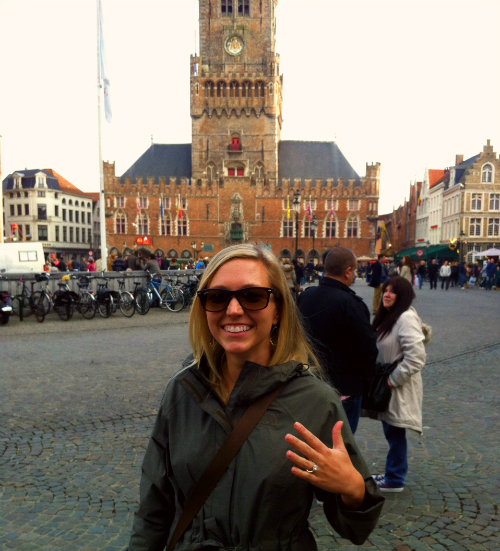 Today I’ve got Bruges on my mind because it is the 2-year anniversary that my husband proposed to me there. It happened along a picturesque canal and we celebrated afterwards as any Belgian would do with many strong beers. Let’s just say it was an early night. Bruges is located a little over an hour northwest of Brussels, the capital of Belgium, and only about 2 hours on the train from London or Paris (3 from Amsterdam) which makes it an easy weekend destination if you’re visiting one of those cities. It is pretty small so you don’t need more than a couple of days there to get a real feel for the culture. The local language is actually a dialect of Dutch (Flemish) but most people know English. French is not really spoken here despite it being the language in Brussels and other parts of Belgium. In addition to wandering the quaint, cobblestoned streets and getting lost along its many picturesque canals, here’s a list of 5 things you should do in Bruges, most involving food and/or beer. Don't say I didn't warn you. 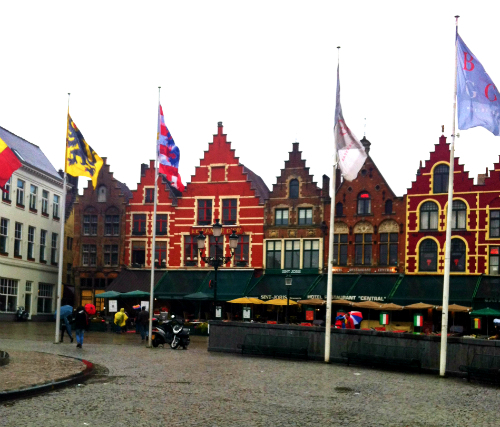 Check out the scenic main square, Markt. Despite being very touristy, this square is still a must see with its Dutch step-gabled buildings, horse-drawn carriages and dramatic medieval facades. If you've seen the Colin Farrell movie In Bruges, this is where the famed belfry resides. As with any main square, there is no shortage of cafes, restaurants and shops. Bruges tends to clear out in the evenings so come back here at night when the buildings are beautifully floodlit for a quieter, more romantic experience.